Tomatoes in February…Let Spring 2010 begin! So, I got my seeds and headed on over to Wally world, where I picked up a 6 dollar Jiffy brand 72 cell greenhouse. I have used them in the past, and I have been pleased with the results. Plus, I mean…they’re only six dollars and the peat pellet refills are extremely cheap, too. I put 2 seeds in each peat pellet, and I planted tomatoes, peppers, and parsley. That was on February the 5th. Today is the 15th, and most of the tomatoes have sprouted well and one pepper is just beginning to sprout. (thanks, Tayce!) So, I will let the little plants keep on growing until they are looking crowded and then I plan to move them to a larger pot (yogurt cup, maybe? 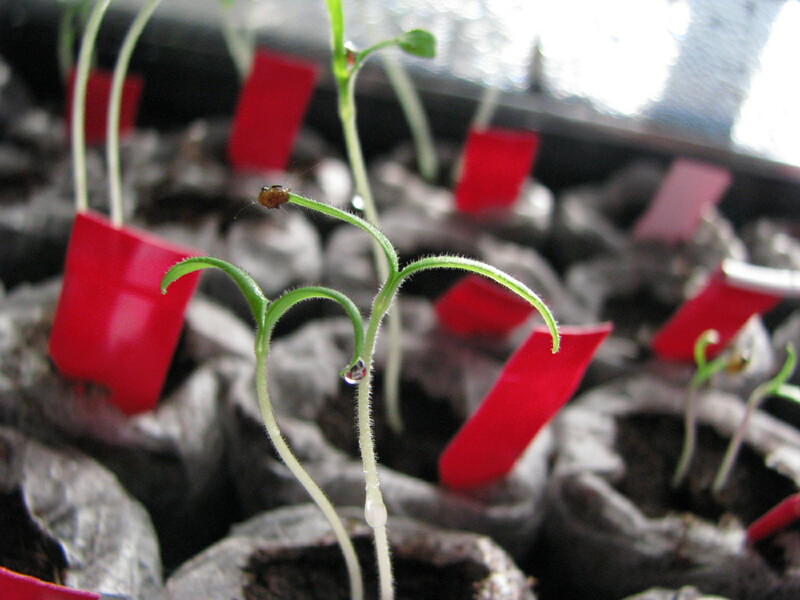 ), and let them get a little bigger before transplanting them. This will be my first year ever to grow all of my own stock. Exciting!!! Now, for planting dates. If you are here in Texas, here is the recommendations I typically go by: Spring Planting Dates I am in Region III. March 15th is considered our last frost date, to which you all who live here know that to not be the norm. We usually have one last frost in April. 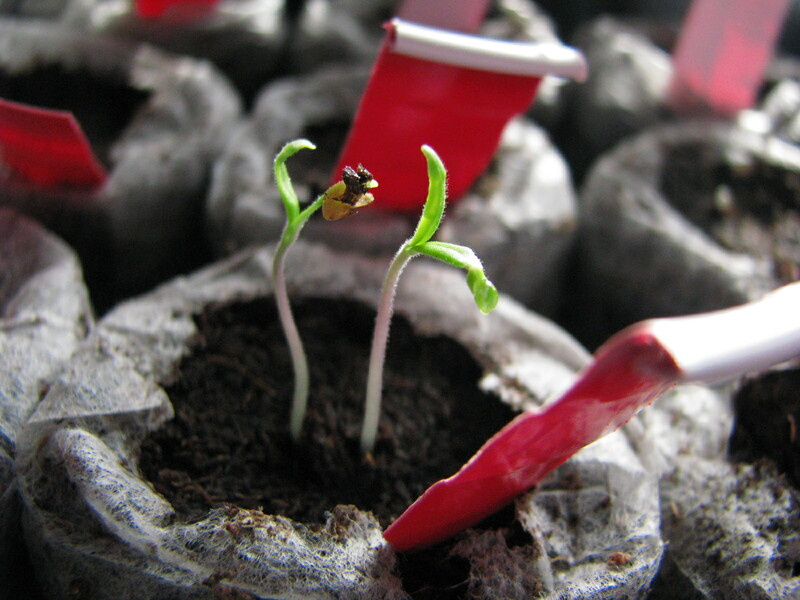 SO, if you decide to plant your warm weather crops, such as tomatoes or peppers come March 15th, you’d better bet your buttons you’ll have to provide some frost protection at least one more time, or your baby plants will suffer frost damage and possibly die. For a freak cold snap, it is often enough to cover the plants with milk jugs with the bottoms cut off to completely cover the plants, or you can use buckets (I love my 5 gallon buckets). This prevents the frost from settling on the delicate leaves. During a late cold snap last year, I used milk jugs for my peppers and tomatoes, and while the tomatoes suffered minor damage, the peppers didn’t fare as well, which is why THIS year I won’t be planting them until mid April, but that’s just my personal choice. I probably, in retrospect, should have also thrown an old blanket or some hay over the jugs, too. If you are in East Texas, here is a great Month by Month calendar on what to do in the garden. For recommended varieties of veggies for East Texas, look here. In fact, this website, set up by the Smith County Master Gardeners, is great. Go to East texas home Gardening tab for lots of info. Recommended varieties are the ‘tried and true’. However, this year, I am adding a lot of different tomato varieties, so I am excited to see how they do! There are test gardens all over the state who are continuously trying out different varieties to see which ones perform the best overall. I love Baker Creek seeds! They have the best selection of heirloom seeds. I started about 75 tomatoes one year in my kitchen right after Valentine’s Day. By March I had transplanted them into 1 gallon buckets and my kitchen looked like a rain forest, no kidding. I had grow lights hanging everywhere and plants anywhere I could put them. I wish I could find the pictures of that! So what kind of tomatoes are you planting? I love to grow different! Like green, purple, white, striped! I am a seed addict! Which reminds me…I am going to go to rareseeds.com right now and try to get Paul Robeson tomato seeds. I always wait to late and they are sold out!